I had chariot music in my head for much of the week. “Swing low, sweet chariot”, both the gospel version and the Parliament version (https://www.youtube.com/watch?v=zEfIkuTtzQ4). I did my formal scrying session earlier in the week than I normally do. The session started with some hiccups. I propped up my card and settled myself to get to work. I began to call on the Chariot and the card falls over. I set it back up and begin again, calling as I have for the past cards, but there is nothing happening. So I decide to raise my voice loudly and call again and it was like a switch flipped on. I needed to command. The background of the card seemed to swirl with energy and the charioteer took a pleased expression on his face. His nose turns yellow. I call him to be an ally with me and he smiles. I ask him, “what lessons can you teach me?” In response a monstrous mouth, a dragon’s mouth, open at his belly but it passes quickly. He points to a horizontal bar on the chariot “ready the field”. Then I see rays beaming down onto him from above, “receive your blessings”. I ask, “what are the names of your horses?” He says “Endurance [the horse on the left] and Escape [the horse on the right]” Escape looks directly at me with an appraising look, weighing me. I ask, “what does your banner represent?” He says, “I travel the night sky.” I ask, “are you the Sun?” and he says “no, I am on the other side of the Fixed Stars” and I see him as the driving force behind the Premium Mobile. I see an image of an asteroid, a great stone hurling through space, with the charioteer standing on top and the two horses appear to be men steering the asteroid seated in the front. It reminds me of the captain and the helmsmen of a television spaceship. Then the conversation kind of lulls and we just sort of sit there looking at each other so I close the session calling on the Chariot to be at peace and to be a presence in my life. 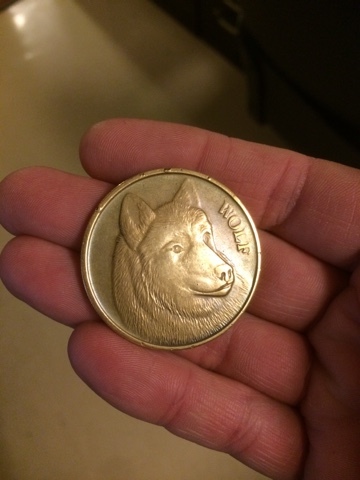 Did I ever tell you about my Wolfcoin? It's one of my divination tools for yes/no questions. I consecrated it long ago. I carry it with me. Each morning I ask it "will you answer my questions truthfully today?" If it says no, I put it back in my bag until the next morning. If it says yes, I'll ask it questions throughout the day. I’ll admit up front that I didn’t give the Lovers the attention they deserved. That’s not to say that I did nothing with them or that they weren’t responsive, but I feel like I just scratched the surface. One reason I feel like I didn’t get to dig as deeply as I had hoped is because I seemed to be spending more time with my family and wasn’t able to be alone for much of the week. Could this be some of the influence of the Lovers? Perhaps. Last Friday I put down the Hierophant and picked up the Lovers with the usual small ceremony. Then somehow I became distracted and didn’t do any work with them until Wednesday. Valentine’s Day was in there and my partner had time off from work so there were things happening. In my informal work I received impressions of reunion and partnership, the Hand of Providence stirring hearts in accordance with Divine Will, and the incredible force of those impassioned hearts. I also received suggestions that there were connections here to the story of Demeter and Persephone and their mysteries. On Thursday morning, the last day, I got up early and tried a more formal skrying session with the card. I sat with my candle and card and called to the Lovers. Soon there seemed to be a bright light pervading the room, diminishing the light from the candle and from the bulb in the ceiling. This was the indication of the spirit of the card. I asked “What are the lessons you can teach me?” In response my attention was drawn to the tip of the cherub’s arrow and I was told “weighing of possibilities”. The figure on the right seemed to have gold at her wrist and at her ears- “value”. Then all four figures glow with energy and the cherub’s sun resembles a skull. I ask “How can I use your energy in my life?” The central figure looks sadly to the left and I’m told “empathy” and then “ease of passage”. I’m not sure what to make of ease of passage. Then it appears as if the three figures are talking to each other, specifically the figure on the right is telling an amusing story, but I can’t hear what is being said. They all laugh and I can see that they are all connected to each other by their happiness. I ask “what is your message to me?” In response the cherub and sun become a large hand reaching down toward the Lovers. It is the Divine Will, the Hand of God. After this I can hear my family stirring and waking up elsewhere in the house. Soon I’ll not have the luxury of solitary time. I thank the Lovers, tell them to be at peace, and end the session. I think there is much more to this card than what I was able to access. I can feel it, there is a great mystery here. I find it interesting that the keyword I usually use for this card in readings is “choice” but I didn’t feel that at all during the week. I will definitely be digging into this one more once the cycle is done. So far the Hierophant has not turned out to be what I expected. I’m not done working with him certainly but at the moment I’m confused. I tried to start the week normally with putting down the Emperor and picking up the Hierophant but due to some missteps on my part I still had the Emperor popping up well into Friday. At any rate, I had some informal input from the Hierophant over the weekend. We talked about my practice and my need to take ownership of some things. He gave me some pointers on modifying my method of prayer. So far things were moving as I expected. Then, yesterday, I sat down to do a more formal scrying session with the card. As usual I set up a candle and my notebook and pen with the card propped up in front of me. I called to the Hierophant saying “come to me, speak to me, share with me your wisdom, show me your forms.” Soon the hair on the back of my neck stood on end and I developed a flutter in the eyelid of my left eye. I took these as signs the Hierophant was with me. He appears to inspect something in his hand and he says “examine details closely.” Then he looks directly at me and he is cross eyed! He rests his chin in his hand and he starts giggling. I was quite taken aback. This is not the behavior I had expected. He is acting more foolishly than the Fool did. I decide to keep going and see where this takes us. I ask, “are you not solemn?” He nods vigorously with a blank and vacant look on his face. Then he does a weird kind of inverting, imploding kind of thing in which his face seems to swirl back into itself, concentrate, and then shoot as energy out of his eyes. I ask “how can I ascend to the next level?” He shrugs and giggles again. I’m starting to get disappointed. I’m not sure what to make of this Hierophant I’ve called. He doesn’t seem to take any of this seriously. I ask “who are your two acolytes?” He tells me they are Soul and Spirit. Then the two acolytes grasp the hem of the Hierophant’s robe and pull it open. Behind is revealed a landscape at night with a path that runs to the horizon. It reminds me of the Moon card but I know it is a different landscape. Ok, this is progress. A little more mystery and a lot less giggling. I ask “how can I use your energy in my life?” Before he can answer a large fly starts buzzing around the room, distracting us both. Then he points to his mantle and says “authority”. This strikes me as a little odd given his irreverent behavior. I ask him to be a presence in my life. I ask him “what are the lessons you can teach me?” He gets an intense look in his eyes and tells me “strategy to strike at your enemies" [this too strikes me as odd], "the uses of madness, knowledge of hidden spirits”. At this I see the face of a spirit resolve just behind him composed of his hair and details from his chair. Then the Hierophant starts blessing me- bless you, bless you, bless you- as if I sneezed several times. He says it in a rather sarcastic way. It is not solemn, it is not holy, it is not reverent. I see a doorway open behind the Hierophant. The spirit in his hair looks worried. I see a worm, like a grub, curled up in his beard. “That!” he says emphatically, “is the reason I’m so crazy". He smiles at the spirit and the spirit smiles back at him. Then, not looking in my direction, the Hierophant waves me away, still smiling at the spirit. I thank him for his time and tell him to be at peace as a license to depart and end the session. I don’t know what to make of it. I’m confused. I will definitely need to do another scrying session before Friday. So I seem to have developed a pattern with this working. For the majority of the week I’ll be somewhat informal, calling for the spirit of the card as I go through my day. Then, at some point, I do a more formal scrying session, usually close to the end of the week. I had expected that in this way I would encounter examples of each of the archetypes as I was out in the world. For better or worse this hasn’t happened in the way I expected. With the Fool and the Magician communication was immediate during the informal phase. They each spoke to me on Friday morning. The Priestess waited for me to come to her. The Empress and the Emperor were both vast in a way that made calling almost seem silly, they were always there and everywhere. The Empress made the world seems shinier and more beautiful. The Emperor was pervasive, in the very structure of the Universe. His words to me were filled with authority and I was always sure when I got a message from him. He called me to examine my discipline, he called out some of my weaknesses- particularly my self-indulgence. He suggested I needed to strengthen my will. He showed me right angles. He showed me walls and the breaches though them. He taught me about establishment of place. He told me about the rewards of patience and avoiding haste. With his scepter he measures the circumference of the universe. I asked him what his connection is to Lucifer. He tells me that he is every Emperor as his face becomes a scrambled mask. I poured heart energy into him as I did with the Priestess, but he kept it in his scepter and looked at me critically. I had a hard time putting the Emperor down. He kept coming up into Friday.